Chef Boyardee was, in fact, a real person. 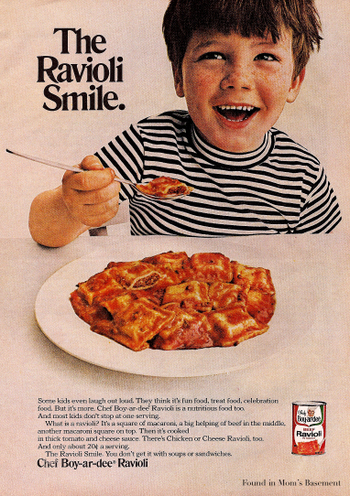 Born Ettore (Hector) Boiardi, Chef Boyardee was a real man and a real chef (unlike Mrs. Butterworth or Betty Crocker). There has even been an internet rumor denying his existence, claiming that “Boyardee” was combination of the names of three food company executives; Boyd, Art and Dennis. Hector Boiardi was born in Piacenza, in northern Italy. When he was sixteen, he immigrated to the United States (through Ellis Island) to join his brother who was working as a waiter in New York’s Plaza Hotel restaurant. While working in West Virginia’s prestigious Greenbrier Resort, Chef Boiardi supervised the catering for president Woodrow Wilson’s wedding. On December 18, 1915, Chef Boiardi supervised the catering for President Wilson’s second marriage to Edith Bolling Galt. His first restaurant was Il Giardino d’Italia. After dazzling Cleveland with his Italian fare as head chef of the Winton Hotel, 24 year old Hector Boiardi opened his first restaurant, Il Giardino d’Italia, in Cleveland, Ohio in 1926. When customers began begging Chef Boiardi for either his spaghetti sauce recipe, or a sample to take home, he began filling old milk bottles with his sauce and giving them to customers.. Eventually, the chef started charging his customers for take out orders of uncooked pasta, cheese, and especially his popular sauce. Whatever time the chef had away from his restaurant was spent filling milk bottles with sauce in his loft apartment. By 1928, the demand increased to the point that factory production became necessary. Eventually the sauce sales surpassed even his restaurant’s business. In 1938, Boiardi moved his factory to Milton, Pennsylvania and began to develop a national marketing strategy for his food. All of these (Italian foods were considered new and fashionable in the United States at this time., Spaghetti products were an inexpensive way to feed the whole family., He had been so sucessful in Cleveland, why not try a national market!). Italian-American food, like spaghetti and meatballs, had emerged from the isolation of small Italian neighborhoods in large cities (“Little Italys” existed in New York, Boston, Cleveland, etc.) into a general American culinary culture. Pasta and sauce were easy to produce en masse, and could be sold at reasonable prices at a time when the average American didn’t have much money to spend on food. He changed his name to Chef Boyardee because he wanted to insure that Americans could pronouce his name properly.. 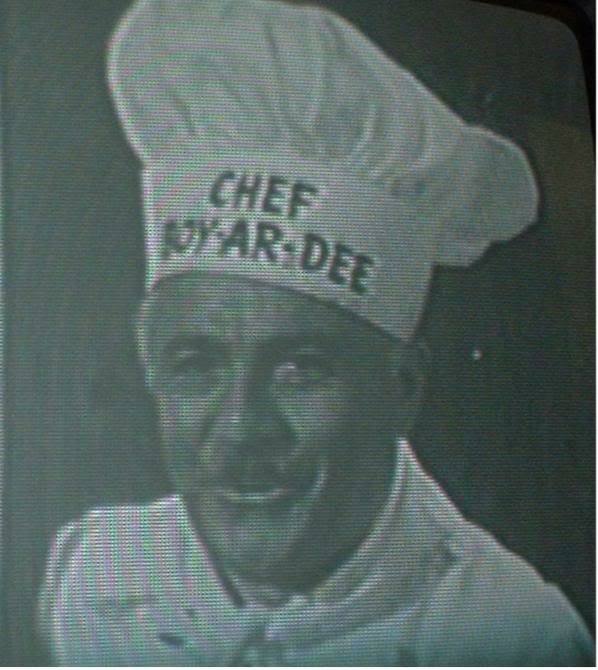 Chef was very proud of his Italian heritage, and “Boyardee” was nothing more than a phonetic spelling of his surname. Finally, all Americans could pronouce the celebrated chef’s last name! In 1946, Chef Boyardee sold his brand to American Home Foods for 6 million dollars. Boiardi’s genius wasn’t limited to understanding the American appetite. He invested much of the proceeds from his company’s sale into The Milton Steel Company, which was in full swing producing goods needed for the Korean war effort. Apparently, the investment paid off very well, making the already wealthy Boiardi even richer. He is buried in Chardon, Ohio. Hector Boiardi died a very wealthy man at the age of 87 in the Cleveland suburb of Parma, Ohio, on June 21, 1985. He is buried in the All Souls Cemetery, in Chardon, Ohio. The company was named after its founder, Italian-American immigrant Ettore Boiardi. The company began production in the United States in the 1920s. Along with its canned products, Chef Boyardee also markets boxed pizza and lasagna mixes. In 1924, Boiardi opened the Giardino d’Italia restaurant at East 9th Street and Woodland Avenue in Cleveland, Ohio. He opened a factory in 1928, moving production to Milton, Pennsylvania ten years later. i went to high school with his granddaughter anna! One of my favorite chefs! Love that cheese ravioli. I live in the town next to Milton, PA; his plant is now owned by ConAgra but you can still see the Boyardee name running down the smokestacks. And everyone who’s ever worked there says they work at “Chef’s”. FYI, Milton hosts a HUGE tomato festival at the end of summer because Chef’s contracted out to all the local farmers (of which there are plenty in central PA) to grow tomatoes for them. So there are a bajillion tomatoes everywhere, and often some Boiardi heir shows up to say hi. It’s kind of cool. Brilliant post, but never heard about the guy before. Interesting reading. Thanks. No way! I can’t believe he was a real guy! This blows my mind. Although, I do find it silly that he changed his name as a marketing ploy… I mean, if it works (it did) then great, but at the same time, I’d want people to pronounce my name correctly. I don’t think it is too much to ask. I thought there was a real Betty Crocker, or someone they used.